JNN 21 Mar 2014 Moscow : Pro-Russian politicians and activists in Moldova’s breakaway Trans-Dniester region have asked the Russian parliament to draft a law that would allow their territory to join Russia. The Trans-Dniestrian appeal comes as Moscow moves towards absorbing Crimea into the Russian Federation. Ukraine, the EU and US say that move is illegal. 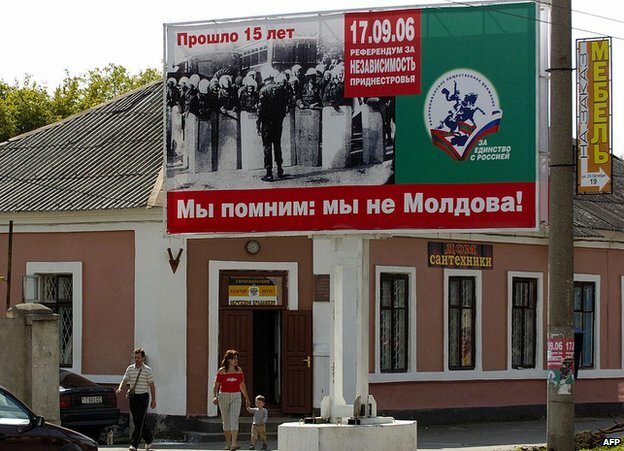 Russian loyalists dominate Trans-Dniester, with support from Moscow. The region split from Moldova in a war in 1991-92, as the USSR was collapsing. Moldova’s President Nicolae Timofti said in a news briefing on Tuesday that any decision by Moscow to accept Trans-Dniester “would be a step in the wrong direction”. In a September 2006 referendum, unrecognised by Moldova and the international community, the region reasserted its demand for independence. Irina Kubanskikh, spokeswoman for the Trans-Dniester parliament, told Itar-Tass news agency that the region’s public bodies had “appealed to the Russian Federation leadership to examine the possibility of extending to Trans-Dniester the legislation, currently under discussion in the State Duma, on granting Russian citizenship and admitting new subjects into Russia”. A pro-Kremlin party, A Just Russia, has drafted legislation to make it easier for new territories to join Russia. The party told the Vedomosti newspaper that the text was now being revised, in order not to delay the rapid accession of Crimea to Russia. The Duma – Russia’s lower house – and the Federation Council (upper house) are dominated by supporters of President Vladimir Putin. Vedomosti reports that the Trans-Dniester appeal to Russia also warns about a possible further deterioration if Moldova signs an association agreement with the EU. Moldova’s leaders plan to do so. The crisis in neighbouring Ukraine erupted after former President Viktor Yanukovych was expected – and then refused – to sign such an agreement. Former Soviet leader Mikhail Gorbachev has expressed support for the recent referendum in Crimea. “If until now Crimea had been joined to Ukraine because of Soviet laws that were taken without asking the people, then now the people (of Crimea) have decided to rectify this error,” Gorbachev told the Interfax news agency on Monday. Gorbachev described the referendum as a “success that responded to the expectations of Crimeans” and urged the world to respect the results. The former Soviet leader also commented on the unilateral sanctions imposed by the United States and the European Union against some Russian officials. Gorbachev said the will of the people in the region should be welcomed rather than punished. Obama’s order freezes any assets of the officials that are inside the United States or “hereafter come within the United States.” The order also bans the individuals from travelling to the United States. The sanctions came after nearly 97 percent of voters in Crimea voted on March 16 to join Russia. This entry was posted in Europe and tagged Crimea, Moldova, Russia, Trans-Dniester, TransDineiter - Moldova. Bookmark the permalink.